This vegan adventure hasn’t been easy on me. I won’t lie. By Friday I was super cranky and yearning for something familiar. I had anticipate this and kept a few meals in my back pocket for such an occasion. My friends and i were heading to the theatre on Friday evening, so I needed something quick, delicious, and comforting to prepare and gobble down before we started the long drive downtown. 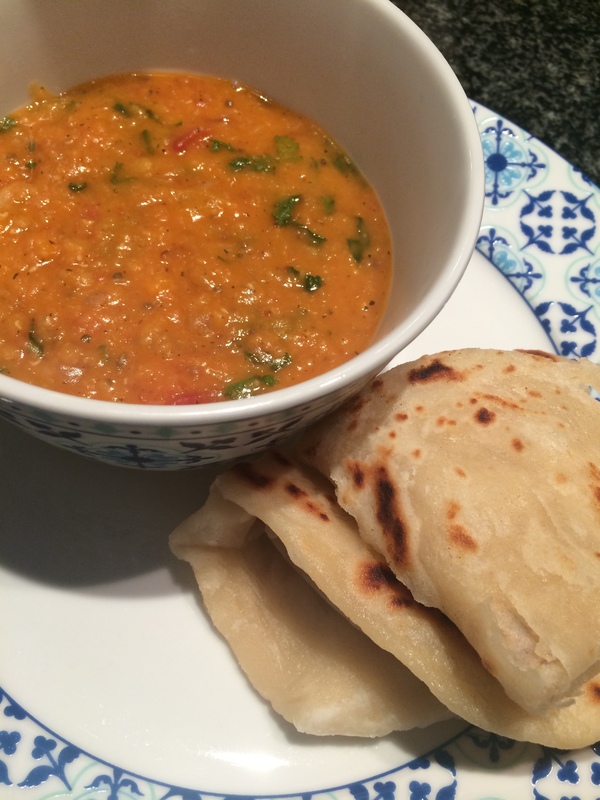 I opted for chapatis and dengu (lentils/dhal). I can’t begin to describe how I make the chapatis, it’s so instinctive for me. But I can do a quick rundown of how to make the dengu. Take some red lentils and boil them in water with salt. I don’t understand people who boil lentils in stock. I always feel like the water doesn’t “enter” them properly. While the lentils are boiling away, in a separate pan fry up some chopped onions, green peppers, garlic and ginger. 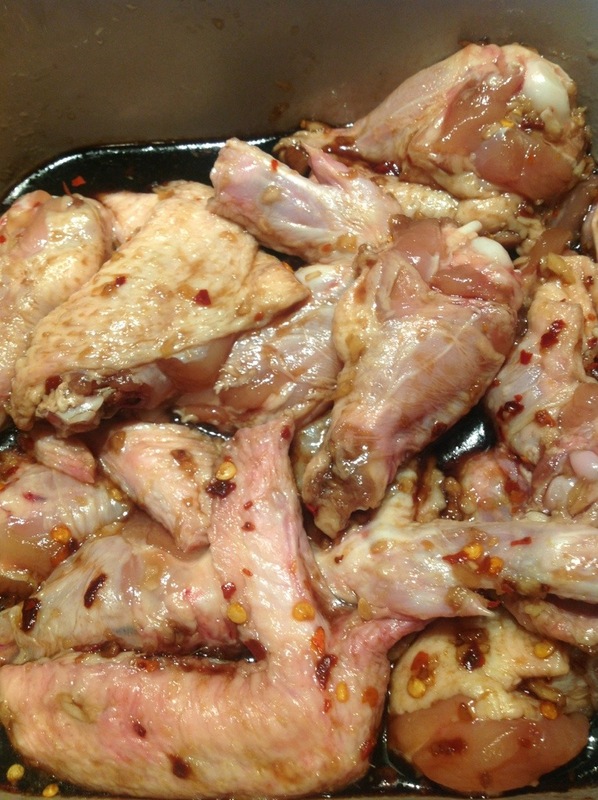 When they are translucent, push them to the side and toss some whole spices into the oil. I used cardamom, mustard seeds , cumin and coriander. When the mustard seeds start popping, mix the onions and spices together, before frying off a healthy dollop of tomato paste. Once the tomato paste is cooked out, throw in some chopped tomato and a healthy glut of coconut cream, then add the boiled lentils and let the two cook together. 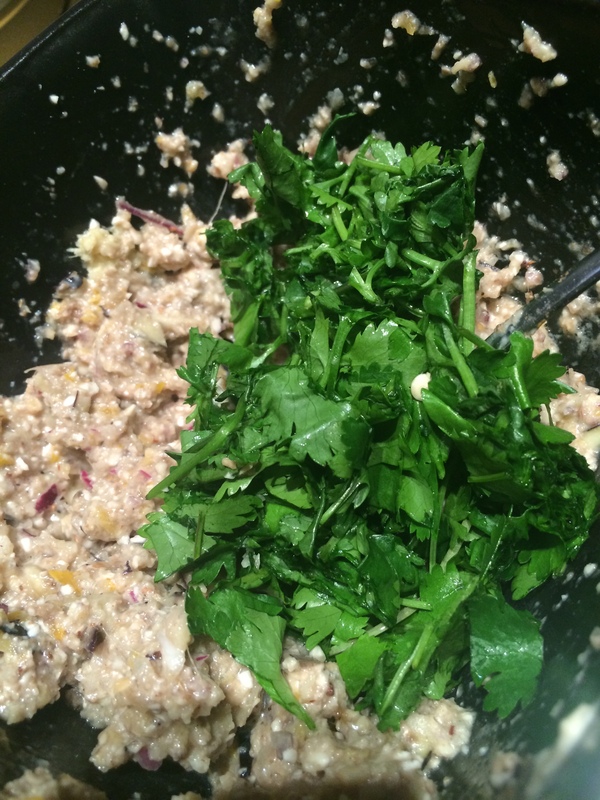 Just before serving throw in some chopped fresh coriander leaves, and enjoy! 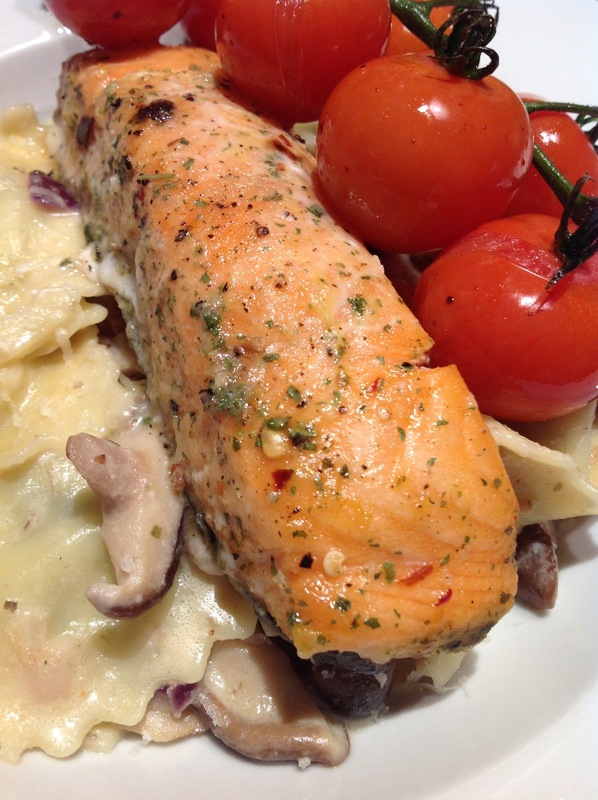 I’ve been eating rather rich food the last few days, so I was keen to have something fresh and clean for dinner. Ok, so I had chips for lunch. I was craving mashed potatoes with oodles of cream and cheese and fries were a good way to satisfy my potato craving without compromising my vegan ways. But I digress. Point: clean and fresh for dinner. I have no idea how I dreamed up the idea of dim sum for dinner. it just felt right. The only problem is that all the store-bought wonton wrappers I’ve ever bought are rather yellow, which must mean they’re made with egg yolks, right? I could make my own wonton wrappers, but is there even a thing such as vegan wonton wrappers? 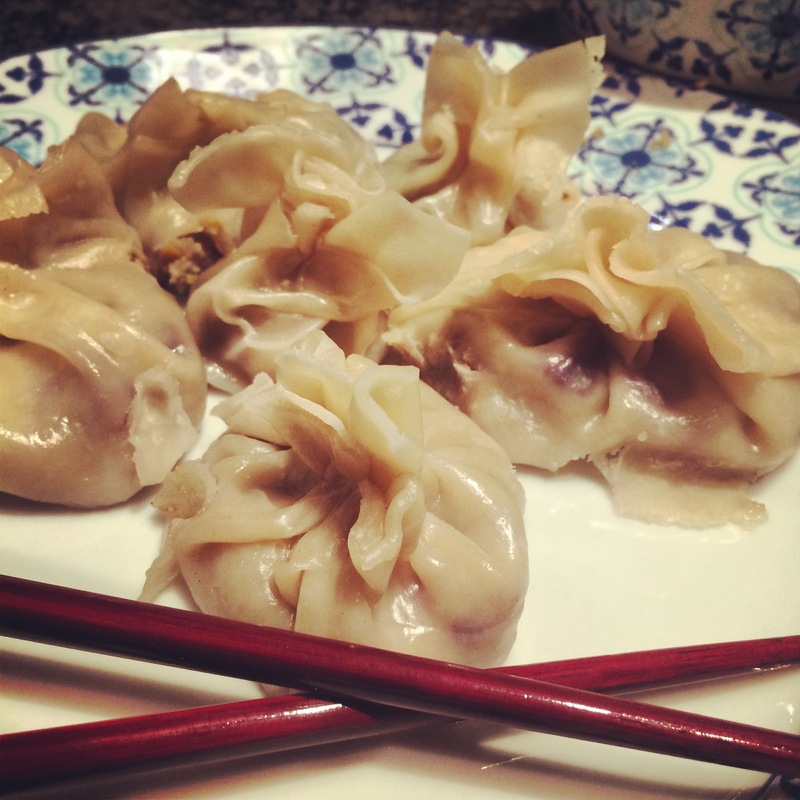 Turns out, no-egg wonton wrappers do exist and they’re not even that difficult to make. 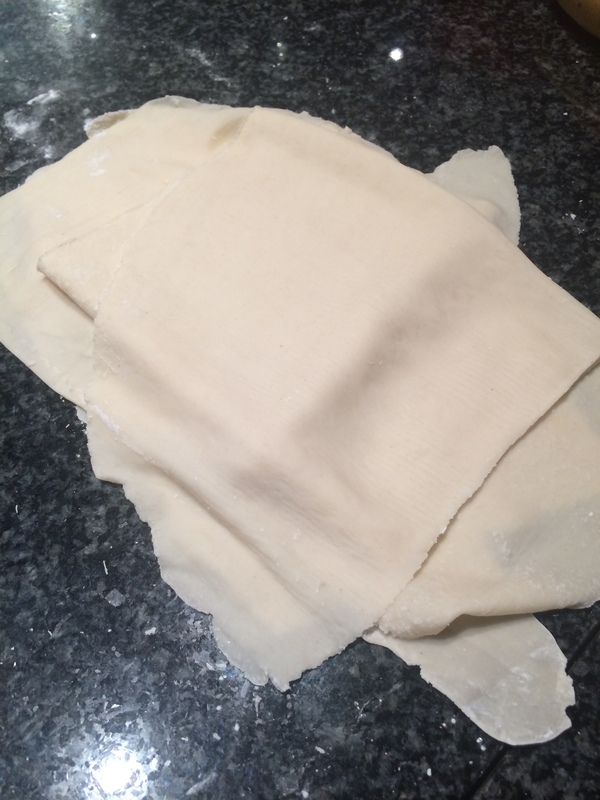 I used this recipe with a few modifications; I ended up using a touch more water than recommended and I didn’t have the patience to rest the dough for a full 20 minutes. 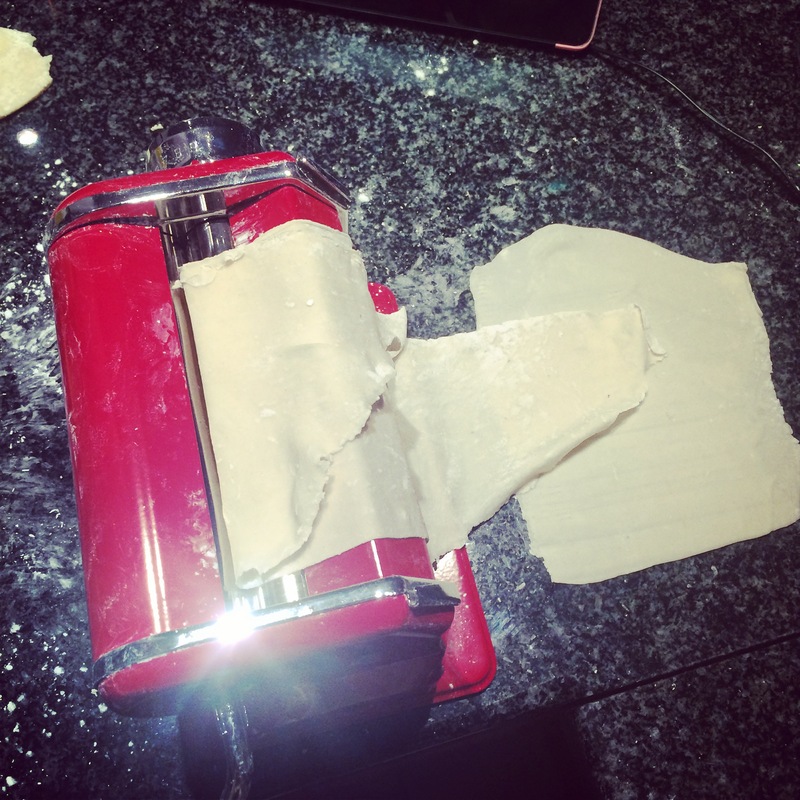 Not keen to roll the wrappers out by hand (impossible with my carpal tunnel issues anyway) I dug my pasta maker out of my cupboard and rolled them out nice and easy (-ish). Aren’t my wonton wrappers pretty? l set them aside, and threw some red onion, garlic, ginger, half an aubergine, half a handful of cashew nuts and some yellow pepper into my food processor. When blitzed, I turned it out into a bowl and threw in some tahini, sesame oil, chinese five spice, salt and loads of fresh coriander. 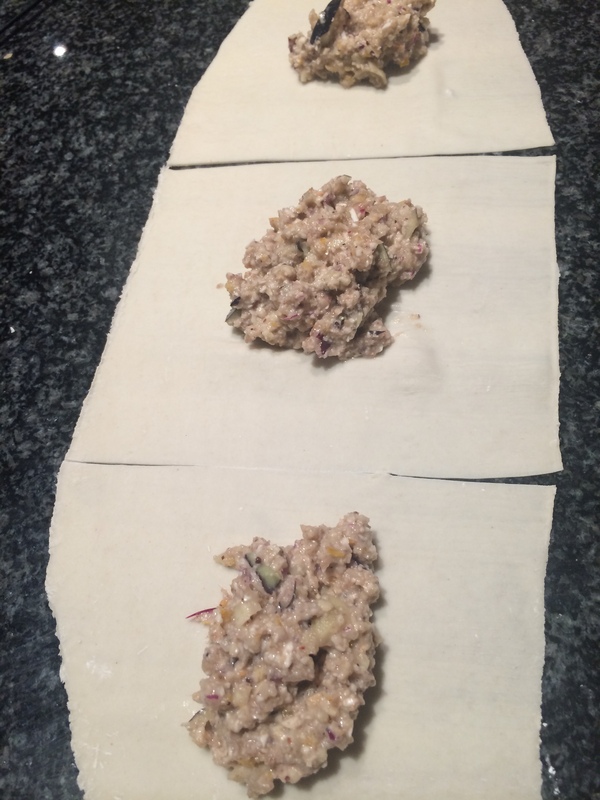 I mixed the filling up and then spooned it onto my cut wonton wrappers, before sealing the ends with water and squeezing the bits together. 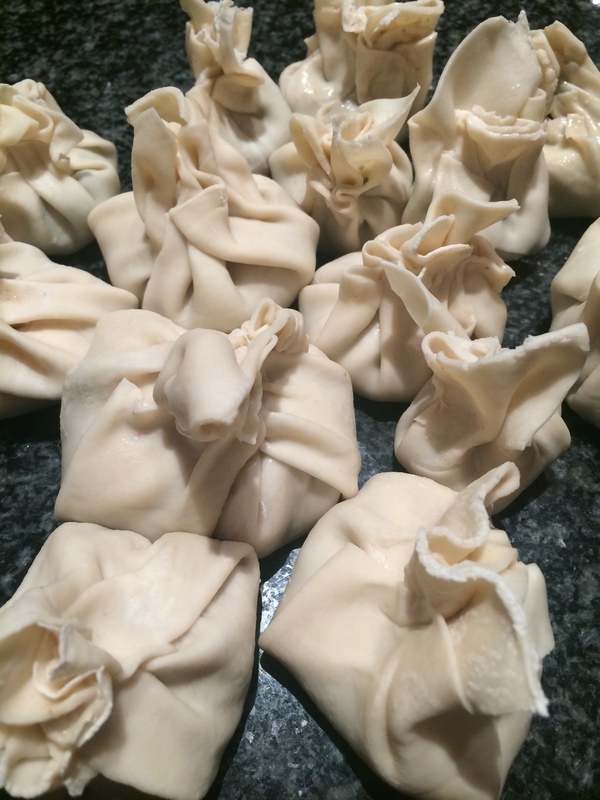 Little and less little dumplings. 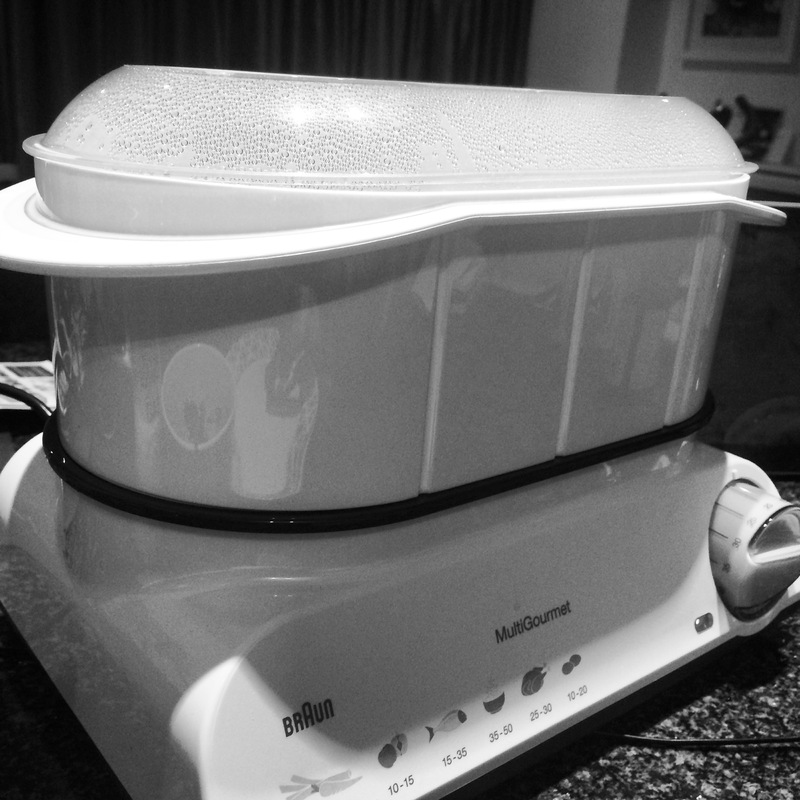 I lined the bottom of my steamer with baking paper then steamed the whole lot for 20 minutes (you really just need to steam them until the wrappers turn translucent). Dinner time! I whizzed together a quick dipping sauce of garlic, ginger, sesame oil, rice wine vinegar, chili flakes and some dry white wine to have with the dumplings. Verdict: Pretty darned good. But this was the first meal this week where I missed animal protein. What I would do differently: Add pork. 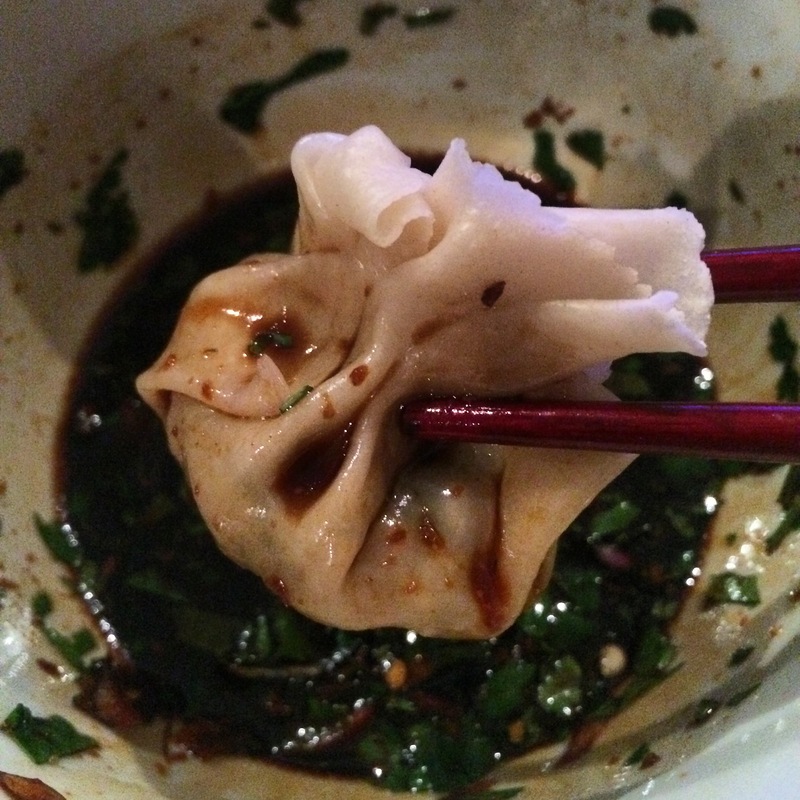 All dumplings need pork. It’s just the way it is. I’d also try and be more consistent with the amount of filling per dumpling. What I would keep the same: I’m super impressed with the wrappers I made from scratch. Also, the dipping sauce is amazing. Day 3 was tough. Really tough. I’d thought the food that would break me would be bacon, or lamb, or perhaps a nice, meaty, juicy burger. But it was an advertisement for grilled calamari that was my undoing. But now I do. I love the way seafood tastes like the sea. Drenched in lemon butter, with a touch of chili, perhaps. The yielding of the firm flesh as you bite into it. Mmmh. Let me stop here before I desert my vegan exploration. All I have to say is the first meal I’m having after these seven days are over is going to be a seafood feast. Back to the pasta. I was craving seafood, but stayed the course, partly because I know some people who are just waiting for me to succumb to the delights of non-vegan foods. 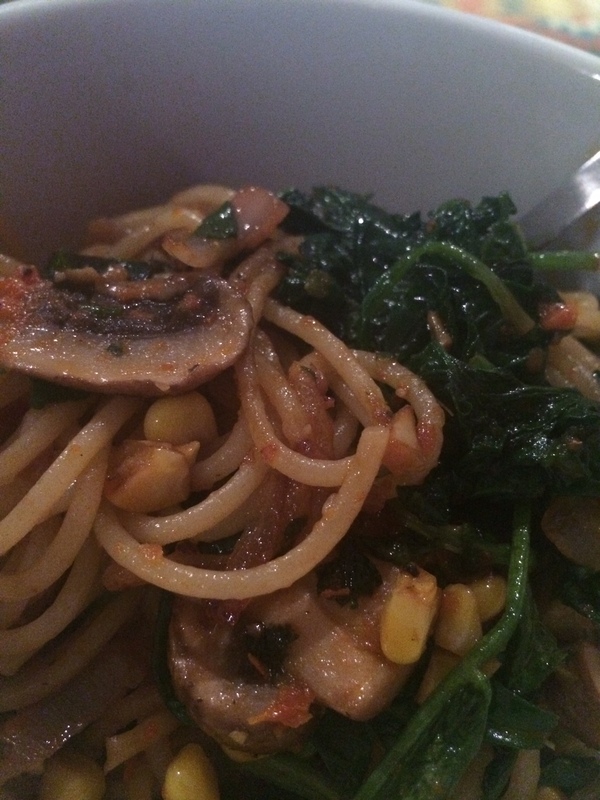 I had a peanut-butter-and-banana snack after work before half-heartedly deciding to make pasta with spinach. Totally unadventurous. I opened up the fridge to yank the spinach leaves out and found two punnets of mushrooms I’d completely forgotten I had. Mushrooms! Umami! Umami was all I needed! Hmm. Call from my sister Zizwe. I told her about my craving for seafood and she said I should shape tofu like a salmon and eat that. How’s that for familial support? Perfection! I took some spaghetti and stuck it in a pot of boiling water. While that was going, I finely sliced some red onions, took some corn off the cob, and sliced up some portabellini mushrooms. 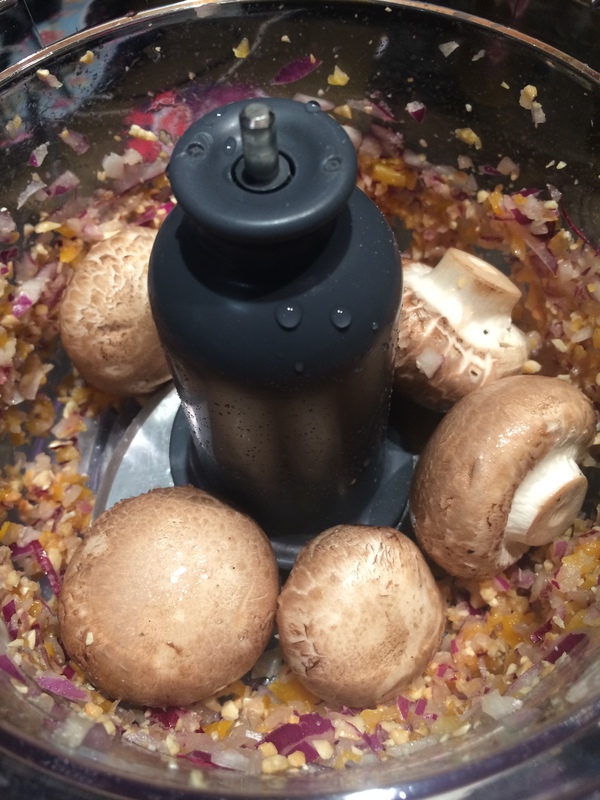 I cooked off the mushrooms in a pan with some thyme and finely chopped garlic. 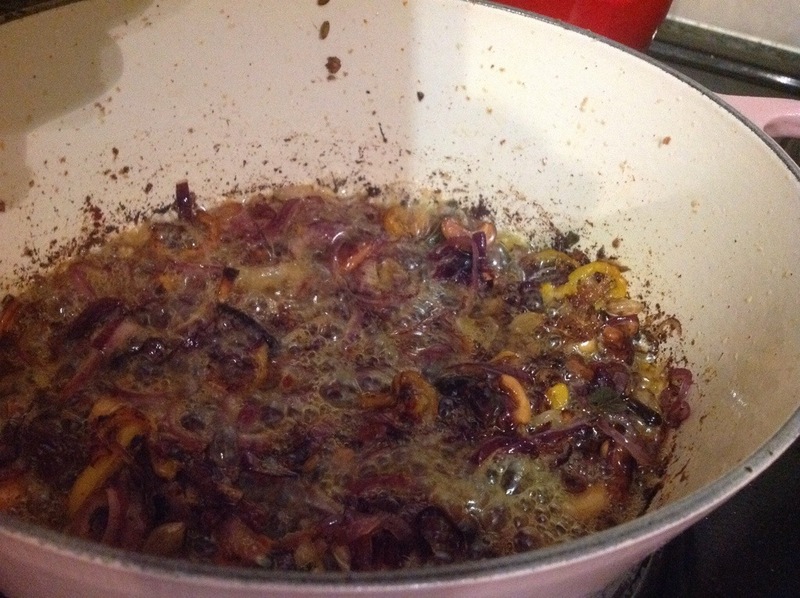 Once done I shoved them to the side and dumped in some olive oil, then fried off the red onions until translucent. To that I added the corn kernels, then put in a generous teaspoon of sundried tomato pesto before loosening everything with the spaghetti water. Once the noodles were cooked I dumped them into the pan and tossed the whole lot. Dinner time! What I loved: everything!!! It was soooo yummy! What I would change: absolutely nothing! You totally need to try this. Bon appetit! Right now I am licking my lips in a most undignified manner. 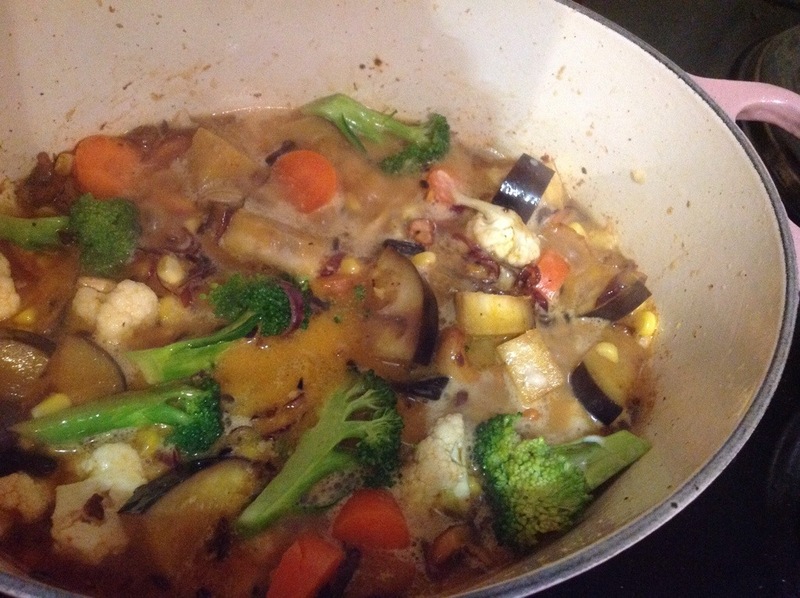 When I first thought up this scheme of mine of eating only vegan food for seven days, I knew the food would taste good (how could I not create delicious food? ), but I didn’t expect it to be lick smacking good! OK, backtrack. I have a pretty standard method when it comes to deciding what to make for dinner. I go to the store and check out what’s available in the fish section; if there’s nothing satisfactory I go to the meats. I buy the meat or fish first and build the meal around the protein. If nothing catches my fancy I usually settle for pasta-and-sauce or something that can go with beans or chickpeas. Or I just grab a bottle of wine and hope for the best. You need to understand – going meat-free doesn’t come naturally to me. I always knew the little piggy who went to market probably ended up as bacon, and I thought that was a most fitting end. I was utterly unprepared for this, but my 7 days of veganism started today. I didn’t have anything appropriate for breakfast, so I guzzled down some clemengold juice before leaving the house. For lunch I mixed up a glass of vanilla Ensure from my emergency office stockpile (I actually had some mushroom soup, but couldn’t find the list of ingredients to check fi it was vegan). Now apparently Ensure isn’t vegan as it contains milk products, but my label didn’t say that so it doesn’t count. 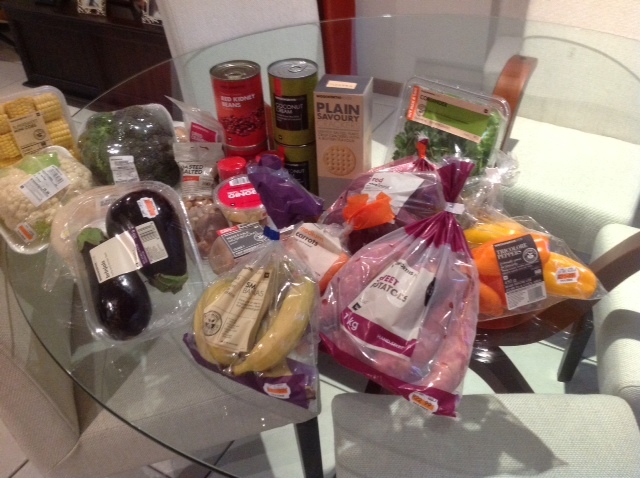 I swung by my local Woolies on the way home, as I barely had any veggies in my house. I got quite a good haul, but it cost me over R500, which proves the point that veganism is a rather expensive way of life. My shopping haul from Woolies. While I was sitting at work this afternoon fretting over what to make for my first vegan dinner, my tastes leaned towards a vegetable biryani. I love a good biryani. 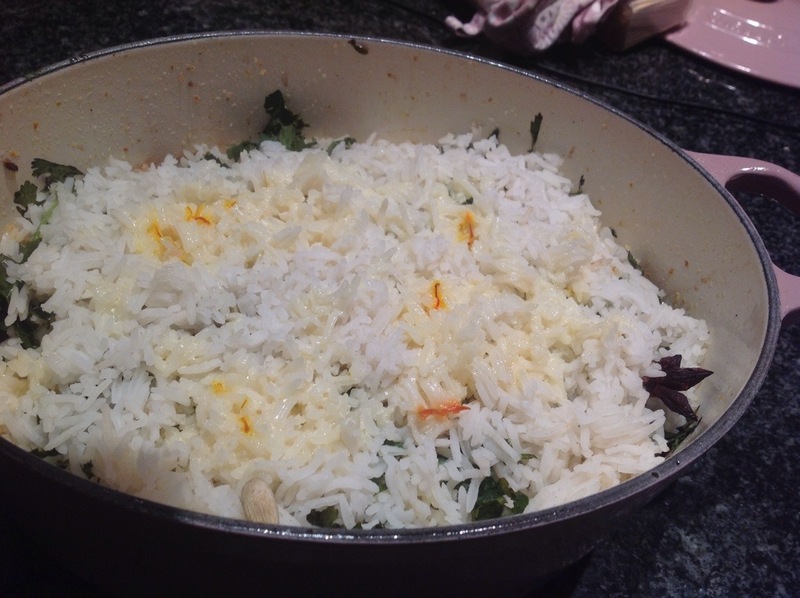 Lamb biryani, usually, but I can’t stand the stuff people so often have masquerading as biryani. If lentils have been stuck in there I’m not interested. Saffron and layering are integral. A quick google search and i found a couple of recipes to guide me. Here we go. I got the rice started. I steamed some basmati with four cloves, half a star-anise, a bit of cinnamon quill, and three green cardamom pods. Don’t cook the rice through; just until it’s 2/3 done. While the rice was cooking, I sliced up some onions and fried them in way too much oil. But I know that a great deal of oil is necessary, and besides, one of the recipes advised that I should “deep fry” the onions. 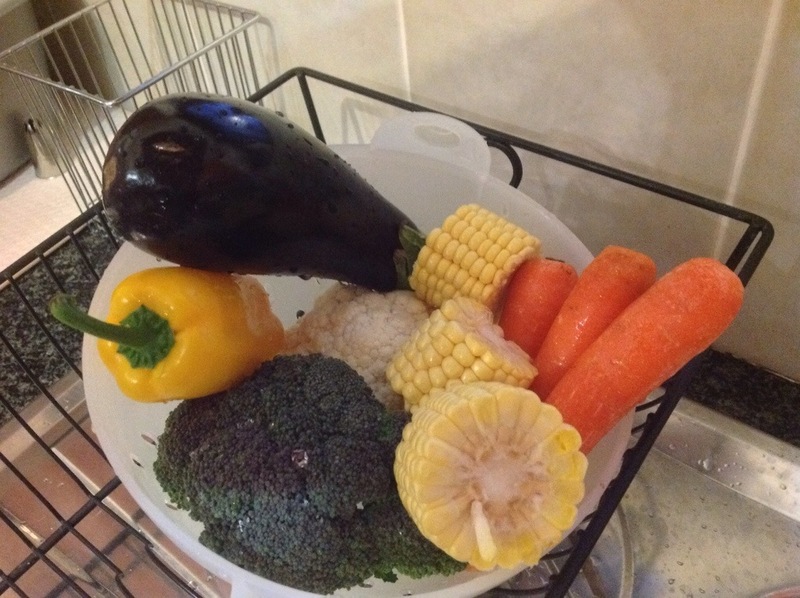 While the onions were frying I rinsed some cauliflower, broccoli, carrots, sweet corn, aubergine, and a yellow pepper and chopped them up. Back to the flying onions. Once they were at that point between translucent and golden, I threw in some curry leaf, sliced yellow pepper and a handful of cashew nuts. Essential for protein, you understand. Be really careful with the cashews; they can burn really quickly without your noticing. I then fished out the cooked stuff and threw whole cinnamon, cardamom, cloves and whole fennel seeds into the remaining oil. Take a moment to appreciate the sons and fragrance of the cardamom pods popping open. I followed that up by tossing a teaspoon of crushed garlic and a teaspoon of chopped ginger into the pot, then stirring furiously. The scent that emanates from the pot shows how magical an aromatic ginger is. I then went off-recipe and squirted in a good amount of tomato paste. I allowed the tomato paste to cook out (essential step!) before throwing in the chopped veggies. I sautéed them lightly, then added about a 1/4 cup of coconut cream, a squeeze of lime juice, and a splash of water, before popping the lid on and allowing it to cook for 5 minutes. While the veggies were cooking out, I finely chopped a handful of coriander with a tiny amount of mint, and also heated up a 1/2 cup of coconut cream with a good pinch of saffron. Oh, and pre-heated the oven to 200*C.
Layering time! 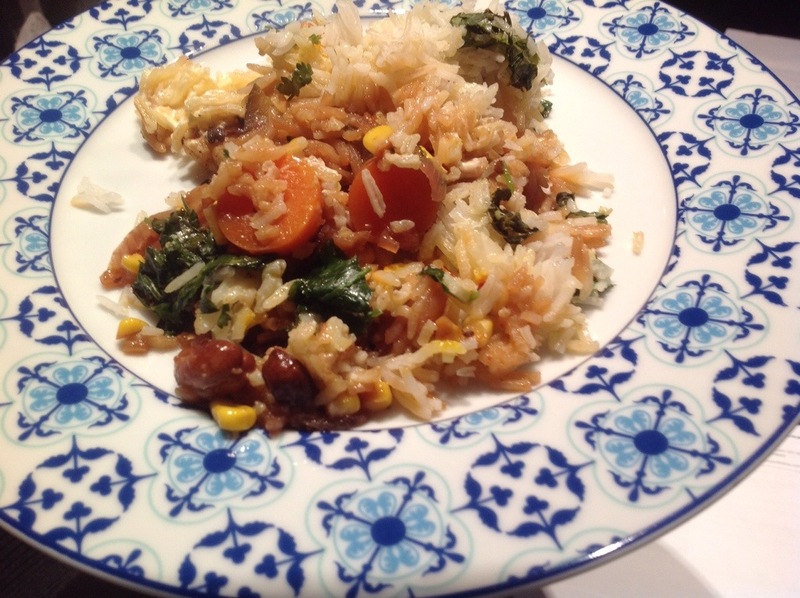 I wasn’t about to make something else dirty, so I eased some of the steamed rice up on top of the cooked veggies, the layered the chopped herbs on top. I then sprinkled the saffron-indued coconut cream on the whole lot, before putting one last layer of rice and sprinkling once again with saffron coconut cream. I sealed the casserole with foil, popped the lid on top, then stuck it in the oven for 25 minutes. Wait a painfully. long. 25. minutes. 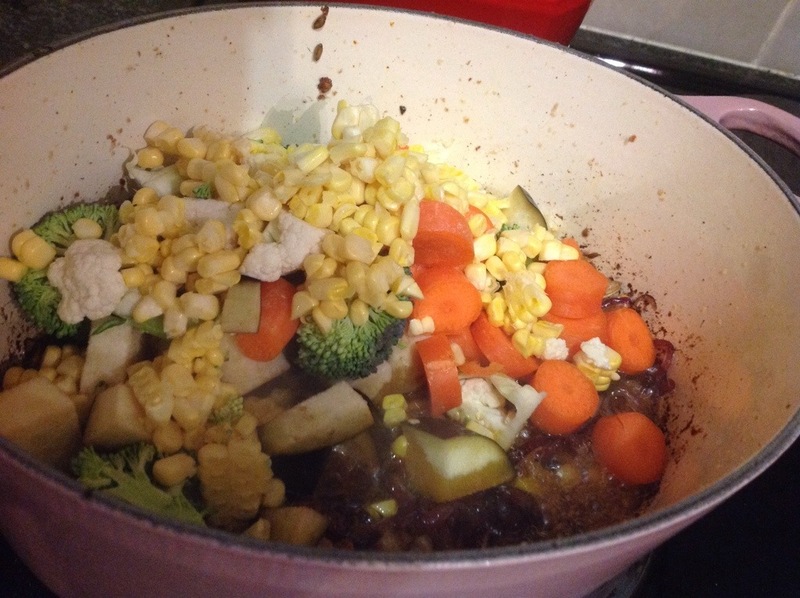 When serving, dig right down to the bottom of the casserole to get all layers of the dish. I didn’t expect to enjoy it so much. I tossed my serving spoon in the sink after my first serving, and had to get a clean one out when I went for seconds. The coconut cream was MAGIC, adding that creaminess I missed from not using yoghurt, ghee or butter. It was super creamy, super rich, and super tasty. Did I miss meat in the dish? Well, I thought of lamb once while I was eating, but honestly this dish doesn’t need any meat. Or dairy, for that matter. 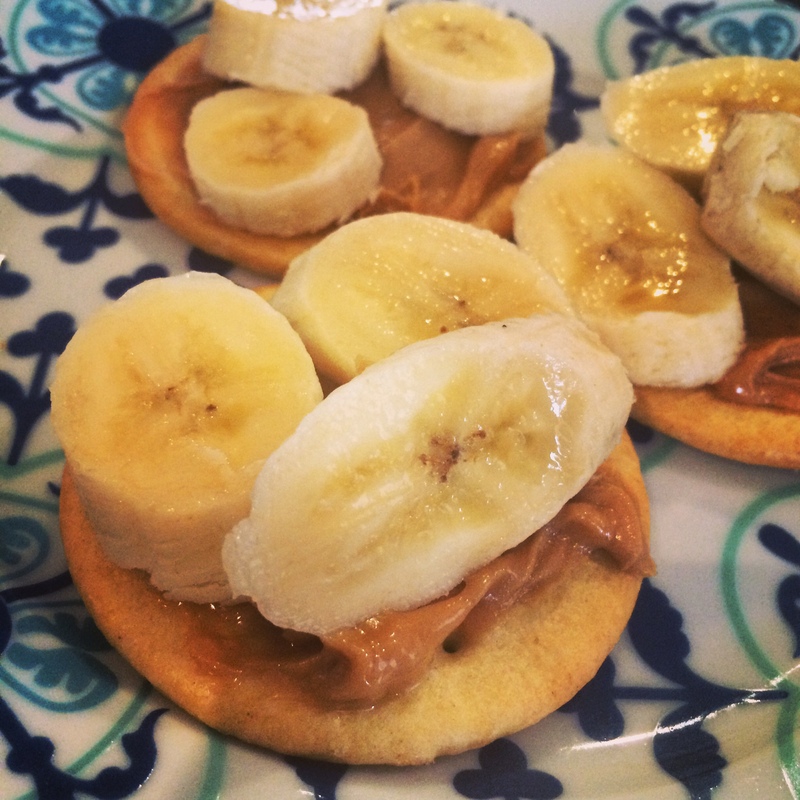 What I didn’t love about this – I didn’t pay enough attention to the protein content. The only protein came from the cashews, and that definitely wasn’t enough. I need to think more about making sure I have enough protein in my food this week. Has it completely turned me off this vegan journey? Absolutely not. I can’t wait for tomorrow’s culinary adventure! A couple of nights ago I had a hankering for fried chicken. I never eat fried chicken from fast-food outlets so was forced to whip up a batch myself. I could only find mini chicken breasts (I prefer wings), didn’t have time for the 24-hour soak in buttermilk, and in a nod to health consciousness (hah!) crumbed but did not batter the chicken. I served it with potato salad and a sweet-&-hot sesame soy dipping sauce, made with jalapeños from my mini urban garden. Happiness! 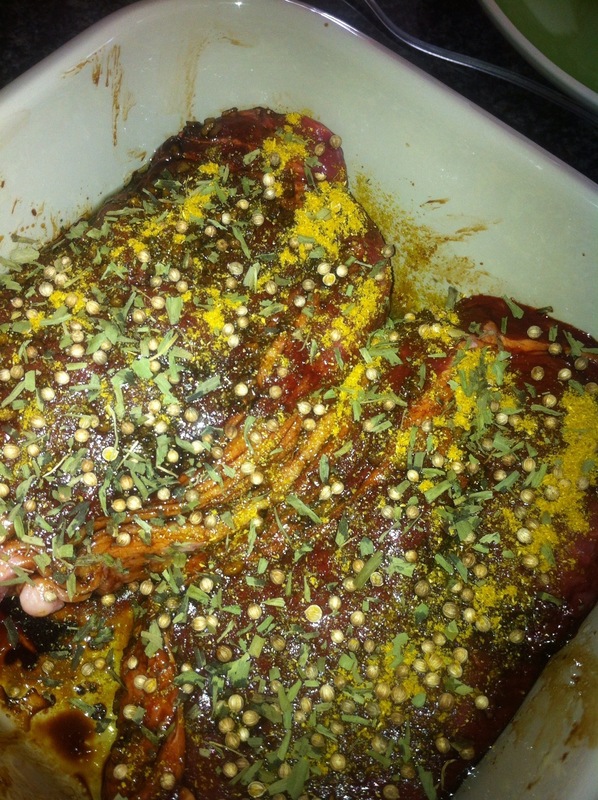 Dinner prep – Woolworths thick-cut mature sirloin steaks marinated in lemon-infused olive oil, soy sauce, whole coriander seeds, dried tarragon, dhania jeera and, of course, freshly-ground black pepper. Talk about fusing food cultures! We’ll see how it works out. It’s a super chocolatey chocolate cake with a dark chocolate ganache filling (and a touch of Nutella), frosted with vanilla and Pomegranate buttercream. 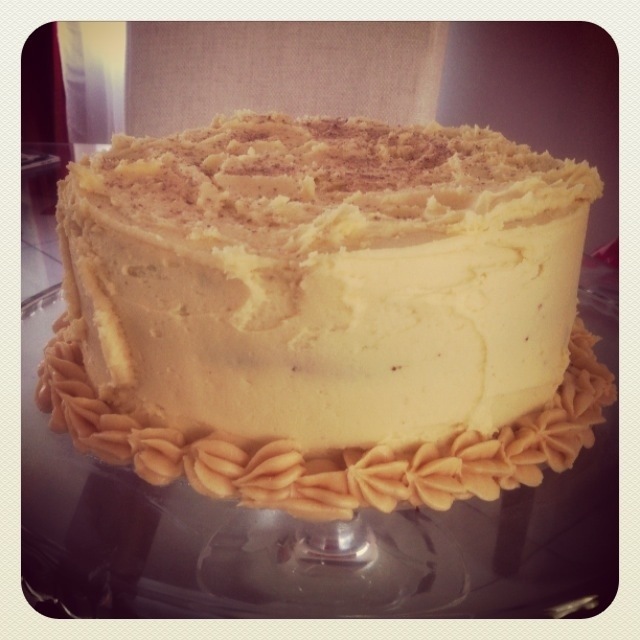 This is the first time I’ve successfully baked and decorated a cake. I don’t know what it is about my people and chicken. Yeah, I said it – my people. Black people. Brown-skinneded people. Africans. No chicken in Africa is safe, least of all on Christmas Eve night. For all we know there could be a chicken out there which holds the gene for the next evolutionary jump but we’d never know cos the bird’s been eaten. Or will be eaten as soon as the drumsticks get juicy enough. I’ve heard a statistic that holds that out of the top 10 best selling products in South Africa annually, SIX of those are chicken products. And just like Shakira’s hips, statistics don’t lie. 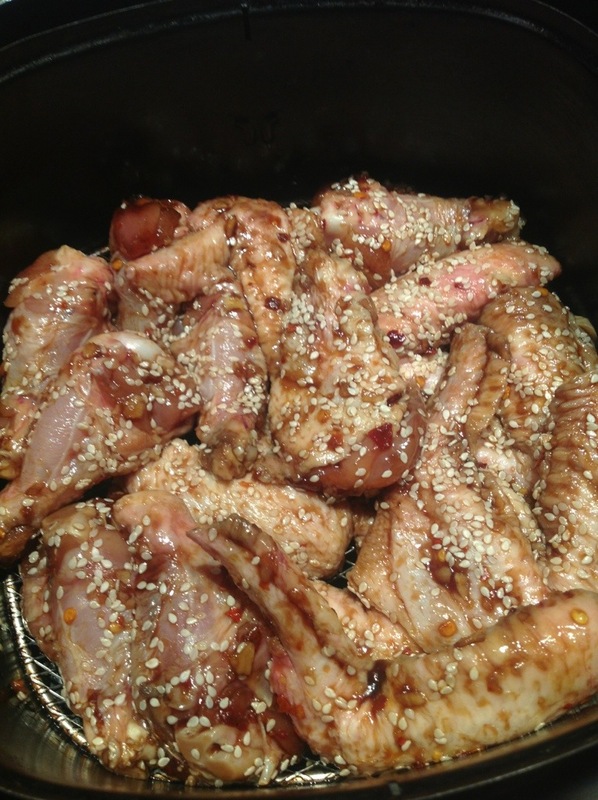 I decided to add to that stereotype by making up some chicken wings. Now, it’s been a long day at work. I’m exhausted. 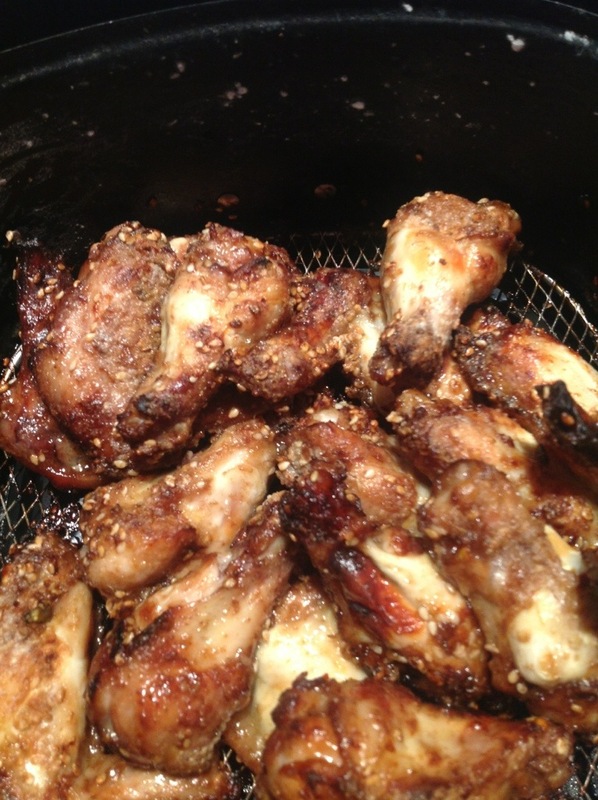 I didn’t even feel like eating but I had marinated the chicken wings this morning so the hard work was all done. I stuck them in the Airfryer at 180* for 8 minutes, took them out, dunked them back in the marinade then tossed them back into the basket, sprinkled with the cornflour mix (shook it through a sieve which made it really easy to get a light, even coat), then stuck them in for a further 8 minutes at the same temperature. I’d had grand ideas of serving them with coriander rice but by the time I got round to cooking that just wasn’t going to happen. 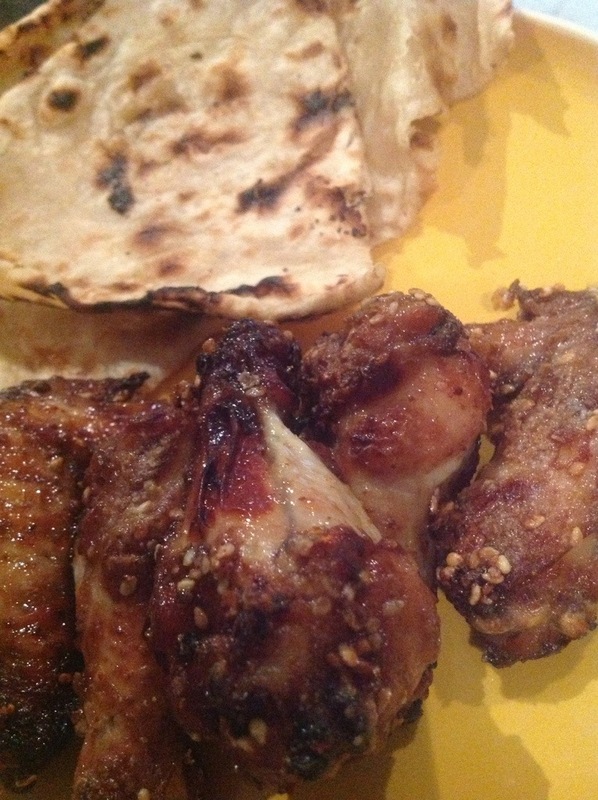 Verdict: were they as good as proper double-fried Korean chicken wings? In a way, no. They didn’t have that super thin yet almost glutinous skin you get from double frying chicken coated with corn flour. But on the other hand, there’s something about the deep fried version that makes me feel uncomfortable and somewhat sick to my stomach, and I didn’t get that with these. Add to that the convenience of not having a vat of used oil to deal with afterwards, or a whole load of dishes or stove-side grease splatter to tackle, and I think I’ll go for the airfried version any day!